Spring is finally here! This is the time that most riders are dusting off their bikes and motorcycles and taking to the roads on two wheels. And who can blame them? The flowers have bloomed, the trees are lush and full of color, and the days have grown long and warm. 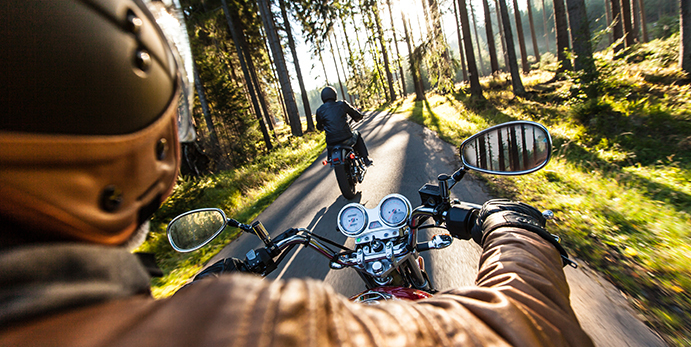 It’s the perfect time to go out and feel the wind rush by while taking to the open roads. With more riders on the roads does come the need for additional driving precautions, though. That’s why the National Highway Traffic Safety Administration has deemed May the Motorcycle Safety Awareness Month, and the League of American Bicyclists has recognized May as National Bicyclist Safety Month. In support of these events, here are some safety tips that will help ensure everyone continues to enjoy the lovely spring weather without risk, whether they are doing so on a bike, a motorcycle, or any other motorized vehicle. Share the Road. Remember, the road doesn’t only belong to cars and trucks. Motorcyclists and bicyclists have just as much right on the roadway as any other vehicle, so long as they follow their own vehicle-specific rules and regulations. Be Aware of Your Surroundings. Because of their smaller sizes, motorcyclists and bicyclists can easily be overlooked, especially if they happen to be riding in one of your vehicle’s blind spots. Before turning or changing lanes, be sure to signal and look over your shoulder. In most vehicles, that is the only way to check the blind spot that the rear and side mirrors can’t spot. Give Motorcyclists and Bicyclists Plenty of Room. Even though they are smaller in size, it’s important to allow bikes and motorcycles enough room to travel safely. Give riders a full lane to drive in even if their vehicles only take up part of a lane. And be sure to allow at least four seconds of space between you and a motorcycle in case you both have to stop suddenly. It’s going to take a car that weighs over two tons longer to stop than a half-ton motorcycle! Drive Defensively. Motorcycles often have the ability to accelerate faster and fit into tighter spaces than most other vehicles. But just because you can drive faster or weave through traffic doesn’t mean you should. Remember, motorcycles are smaller, therefore more difficult to spot, especially when driving fast and erratically. Be courteous on the road, maintain the speed limit, use your signals, and allow plenty of space around your bike. In other words: drive defensively! Wear Proper Gear. Always wear your helmet when you drive a motorcycle. Wearing a helmet could help save your life in case of an accident or collision. Get riding gear with padding to protect you if you fall. Invest in some good non-slip gloves, and boots or riding shoes that cover your ankles. Dressing appropriately can both protect you and make riding all the more comfortable. Follow the Law. Even though you are riding a bicycle, you still have the same rights, duties, and responsibilities as any other driver. You are required to ride with traffic, signal before turning, yield right-of-way, and any other laws of the road. Be Predictable. Surprises on the road can cause accidents, especially for bicyclists. That’s why it’s always important to ride predictably. This means don’t swerve between vehicles, always signal your intentions to turn or change lanes, and check over your shoulder before turning. Be Conspicuous. Always make yourself visible by wearing bright clothes. Also, use a white light on the front of your bike and a red light on the back. Reflectors on your bike and clothing also increase visibility to drivers when visibility is low. Make eye contact with other drivers to ensure they see you. And for goodness sakes: stay off the sidewalks! Think Ahead. It’s important to think before you act while riding on a bike. Try to predict what other drivers will do based on their use of signals or positions on the road. Keep an eye out for potholes, debris, puddles, or other road hazards that can hinder your movement. When you approach a railroad crossing, cross at a right angle. Ride Ready. Before riding, check to ensure your bike is ready for the trip. Make sure your tires are properly filled with air, that your chains are running smoothly, and your brakes are operational. Keep necessary tools in case of an emergency, like a spare tire tube or first aid kit, and always wear a helmet! No matter what type of vehicle you’re driving, be aware of all other drivers, share the road, and drive defensively! Help ensure everyone has an enjoyable ride and journeys safely. Happy driving!